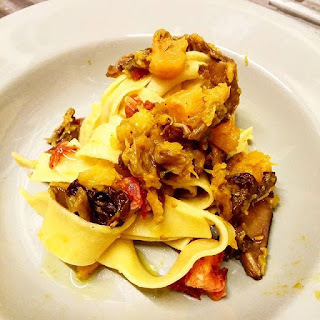 The My Home From Umbria, the Italian supper club featuring produce imported from it's host's home town - is back for 2016 with a twist - it starts with a short cooking masterclass. The next supper is on Thursday 10th March, and features a lesson inmaking tagliatelle at the beginning, followed by her 5 coures menu. Go! "My special, unique and delicious theme for 2016 would be to host/ introduce some of the best chefs that Italy has to offer. My Home from Umbria is not only going to be a dinner to socialize and discover my regions culinary excellence, but it is going to be a real "laboratory of taste" where from one dinner to the next one, guests will be invited to assist to a food demonstration of one of the dish of the evening. The idea is to have a pre-lesson before my dinner party for the people that would like to learn to make dough for pizza, a classic recipe for Italian meat balls, right down to to the ingredient of secret handmade pasta recipes. I want to offer the basic of Italian cooking as simple as possible as a demonstration enriched with story, small tricks and with recipe that I would supply to take away. *Starter: Pecorino di Pienza served with welcome drink DOC Italian wine locally produced in Umbria.